"State Tech that Advanced Level Daters can Leverage to Boost Inner Game"
Not targeted at guys developing their dating skills, shouldn’t start with this product if you don't have a foundation of dating skills and have learned about inner game already. This is a good read for those learning how to control their state better. It provides an easy introduction into the practice of 'mindfulness' and 'positive states', whereas many books that cover this topic are not as readable or relatable to your situation. Integrating these practices into your life will impact your dating skillset significantly when applied properly - and with persistent effort over time. This is an intermediate to advanced level study aid - for people who haven't yet learned about mindfulness and state control. If you are a beginner, this isn't the best place to start - rather check out The Collection of Confidence, the best course we've found to introduce beginners to inner game and get them started in a practical manner. Note: The majority of people who seek dating advice do not at first understand the connection with inner game and why it is so important. Read our explanation of ‘inner game’ so that you understand its importance. 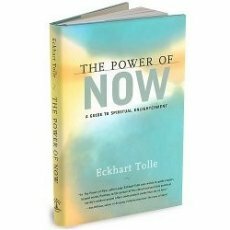 The Power of Now was a groundbreaking book that brought some basic principles of inner peace and state to the mass market. The value of the book is that Eckhart Tolle, rather than creating something new, was that he captured the principles in a very simple form that is easy to understand, relate to and apply in your life. That is the no. 1 reason why this book has stood apart from the mass of books on spirituality, meditation, self actualization and so on that cover similar material. This book is not targeted at men wanting to improve their dating skills. This is an important point, because you will need an understanding of inner game and dating to apply its knowledge. When you read the first chapter on how he discovered his new found inner peace and clarity you will make a direct connection. It strikes a chord with the human condition. This first part enables you to understand that you are not at peace with yourself. He explains in very simple terms the thought processes that show that you are not at peace. His humorous look at how ridiculous some of the mental pain and anguish we harbor is, is a wake up call. This strikes another chord. His mental journey after the first realizations is more difficult to relate to, unless you have made some progress yourself to being more present. When I read this for example, I wasn’t sure about it, it was only three to six months later when I had similar realizations to Eckhart that I accepted this part of his story. Chapters three to five move on to practical implementation. He describes one or two very basic exercises and then focuses on describing the experiences, the inner states and how you can reach these mindsets. This is constantly reinforced, with his own story. These exercises are extremely straight forward. So the value in his dedicating so much of the book to their implementation is in your own understanding of the mental states you will pass through and the underlying reasoning behind it. This clarity is important to your motivation to use the exercises. It provides a useful compass, so that when you have reached a state he describes, you know to look for it again, and the next time it is much easier to find again, thanks to the clarity of your understanding. I want to caveat this point because it is important. These exercises will be very good for your inner game, and easy to implement, provided you know how to go about it. Eckhart doesn’t explain any relationship of ‘being in the now’ to success at dating and with women in a way that most students of dating will understand. You will need an advanced level, experience or previous study of good dating-targeted inner game material to apply this appropriately. For this reason, whilst it is easy to implement in a general sense, to leverage it to improve your dating life it is more challenging. When I first read this book many years ago many of the dating instructors were reading it and recommending it to each other. I, personally, was looking to take my dating skills to the next level, to make it a more natural part of my life, to take the effort out of it. It had a big impact on me, and although it took a few months of thinking about what he relays in the book, and using some of his principles to get there, the book introduced me, day by day, to the state that he discusses. When I finally started getting the ‘elated’ states and happiness and mindsets that Eckhart describes it was a little strange. Waking up everyday and feeling on top of the world is basically what happened. I’ve never taken drugs, but I assumed it could be something like taking an ecstasy pill. It was that powerful. I look back on those days with a little bit of nostalgia, because today I have taken feeling like this all the time a bit for granted. Back then I felt like I’d stepped into a new phase in my life. Needless to say this has had a big impact on my dating life, especially in relationships, and in my life overall. This book is not directed specifically at people wanting to improve their dating skills. That does not detract from its value. However, you won’t be able to use the knowledge in this book to improve your dating life unless you first understand how it is applicable. In fact it could even damage your dating skills if you don’t place this information into the right context. That context will not be transparent to you unless you have studied some aspects of inner game from the dating perspective. So I suggest you take a look at one of the better inner game skillset products that directly target dating in DSR’s Inner Game Skillset Ranking first. This is a MUST read. I suggest you read it after getting a foundation understanding of dating skills, and in particular how inner game relates to the dating skillset so that you can integrate its ‘non-dating directed’ knowledge into your inner game skillset. For guys who already have some dating success, ‘technical’ dating skills such as attraction and approaching, and have a basic understanding of inner game, this is the ideal product to take your inner game and dating skills to the next level.